Home Improvement specialists at A&B Install Hardwood Floors, Tile, Superior Carpet and Vinyl. At Above and Beyond, we have years of experience that we use to craft flooring for you of the highest quality. Many can put in a floor, but to install a quality surface that will last with your home requires skill. 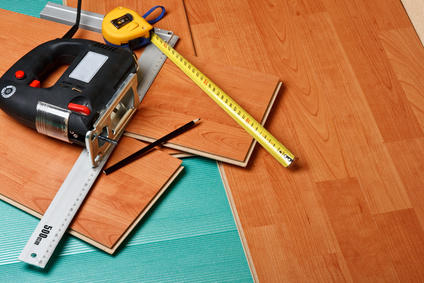 We can install a range of flooring options, including hardwood flooring, carpet, vinyl flooring, bamboo flooring, wall tile, ceramic and natural tile, engineered flooring and much more. Beautiful and long lasting, hardwood floors never go out of style. Choose from verying levels of darkness to find a wood that will match your house perfectly. These very durable floors are great for houses with children who tend to spill things, and clean up wonderfully with just a light mop or vacum. Very low maintenance and sure to make an impression! Vinyl flooring is very popular for the effects that it creates by imitating real types of flooring. While they look just as great, vinyl floors are much more affordable, and easier to maintain. Choose from many beautiful looks such as wood or stone. If you’re looking for a way to make your house feel more contemporary, tile is a great option. Choose from virtually any style, including color, size, and design. Once installed, it will last a lifetime, and we can promise that you’ll love the effect it has on your home.